In this work, the effects of three ionic liquids (ILs), namely, 1-butyl-3-methylimidazolium tetrafluoroborate, 1-butyl-3-methylimidazolium dicyanamide and tetraethyl-ammonium chloride, on methane hydrate formation and dissociation kinetic parameters were studied. The kinetic parameters including the initial rate of hydrate formation, hydrate stability at atmospheric pressure and hydrate storage capacity were evaluated. The experimental measurements were performed in an initial pressure range of 3.5–7.1 MPa. It was found that both of ILs with imidazolium-based cation increase the initial methane hydrate formation rate while the IL with ammonium-based cation leads to a decrease in the initial methane hydrate formation rate. It was also interpreted from the results that all of the three studied ILs decrease methane hydrate stability at atmospheric pressure and increase methane hydrate storage capacity. Finally, both of ILs with imidazolium-based cations were found to have higher impacts on decreasing hydrate stability at atmospheric pressure and increasing the methane hydrate storage capacity than the applied IL with ammonium-based cation. Gas hydrates, or clathrate hydrates, are crystal-like solid compounds similar to ice or snow, in which small molecules of gases and/or some volatile liquids with appropriate dimensions (guest molecules) are entrapped in the empty cages made by the water molecules (host molecules) through hydrogen bonds. The guest molecules, called “hydrate formers,” make the unstable hydrate structures stable. By taking into account the nature, dimension and type of the hydrate formers, three usual structures of I, II and H can be formed (Carroll 2002, 2009). Gas hydrates have been the subject of many scientific studies over the past century (Sloan and Koh 2008). Hammerschmidt (1934) stated that gas hydrates may cause petroleum pipeline blockages, which can lead to economic losses and process failure. Since then, gas hydrates became an unfavorable phenomenon and several methods are used to avoid their formation in the pipelines, such as heating, pressure reduction, water elimination and adding inhibitors. The latter method is one of the most used ways employed in industry (Karaaslan and Parlaktuna 2002; Koh et al. 2002; Lederhos et al. 1996). Since the middle of 1960s, scientists have been attracted to investigate the applications of gas hydrates. Although gas hydrates have the disadvantage of plugging the pipelines, they have various applications. Gas hydrates are potentially great resources of natural gas (Sloan and Koh 2008; Sloan 2003), they can be utilized as a medium for storage and transportation of gas (Koh et al. 2011; Javanmardi et al. 2005; Sun et al. 2003), they can be used as a new method in the separation of gases (Uchida et al. 2005; Kang et al. 2001; Sugahara et al. 2005; Zhang et al. 2009) and a new method for CO2 capturing (Kang et al. 2001; Li et al. 2005; Seo and Kang 2010), etc. Ionic liquids (ILs) are salts that are liquid at temperatures below 100 °C. They have very low vapor pressures and are green solvents (green solvents are environmentally friendly solvents, which can be used as an alternative of petrochemical solvents) which do not decompose even at extra high temperatures. Ordinary ILs may be composed of asymmetric organic cations like imidazolium, ammonium, pyrrolidinium, etc., with alkyl chain and anions like halide ions, tetrafluoroborate, dicyanamide, nitrate, etc. (Wasserscheid and Welton 2008). Several scientists have investigated the formation and dissociation of gas hydrate kinetics in the presence of ILs. Xiao and Adidharma (2009) were the first scientists who used five ILs with imidazolium-based cations as a new class of hydrate inhibitors called “dual-function” inhibitors. Xiao et al. (2010) studied the impacts of six ILs with imidazolium-based cations on methane hydrate equilibrium curves, nucleation rate and growth rate and observed that they had inhibition effects. Del Villano and Kelland (2010) studied the effects of two ILs with imidazolium-based cations on structure II gas hydrates, and they claimed that the two ILs with imidazolium-based cation had a poor kinetic inhibition effect on hydrate formation. Kim et al. (2011) investigated the impact of ILs with pyrrolidinium-based cations on methane hydrate formation, and they observed both thermodynamic and kinetic inhibition effects of ILs. Nazari et al. (2013) studied thermodynamic and kinetic effects of three ILs with imidazolium-based cations on methane hydrate formation. They also presented kinetic modeling of methane hydrate inhibition on the basis of IL nature and electrostatic intermolecular interactions between water and ILs (Nazari et al. 2013). Kang et al. (2013) applied a mixture of ILs and polymer inhibitors and observed a synergistic effect on methane hydrate inhibition. Richard and Adidharma (2013) studied the performance of ILs with imidazolium-based cations and their mixtures with conventional inhibitors on methane hydrate formation. Tariq et al. (2014) performed a full review on the role of ILs in thermodynamic and kinetic inhibition of gas hydrates. Zare et al. (2015) investigated the effect of ILs with imidazolium-based cations and their mixtures with ethylene glycol monoethyl ether on methane hydrate induction time, methane consumption and temperature. Kang et al. (2016) observed the synergistic inhibition effect of ILs on gas hydrate formation when mixed with a common kinetic inhibitor like polyvinylcaprolactam (PVCap). Rasoolzadeh et al. (2016) measured methane hydrate formation induction time in the presence of different ILs and developed a semiempirical relation for induction time modeling. Lee et al. (2016a, b, c) proved that HEMM-Cl acts as a kinetic hydrate promoter and HEMM-BF4 acts as a kinetic hydrate inhibitor for methane hydrate formation. Qureshi et al. 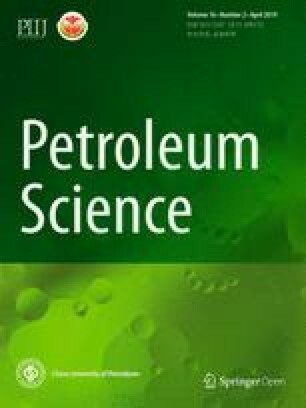 (2016) performed an experimental study of the thermodynamic and kinetic inhibition effects of ILs with synergistic compounds on gas mixtures. Lee et al. (2016a, b, c) performed an experimental study of thermodynamic and kinetic inhibition effects of various ILs and their mixtures with PVCap on methane hydrate formation. Lee et al. (2016a, b, c) evaluated the synergetic inhibition effects of some ILs on the kinetic inhibition performance of PVCap on natural gas hydrate formation. For gas storage and transport using hydrate media, several variables, such as the initial rate of hydrate formation, hydrate stability at atmospheric pressure and hydrate storage capacity, are key parameters (Sloan and Koh 2008). Gas hydrate technology has some advantages. For example, it has low energy consumption, it is clean, it is safe, etc., but some obstacles also exist like the slow rate of hydrate formation and hydrate stability issues (Sloan and Koh 2008). It has been proved that 1 m3 of hydrate can store about 180 m3 of gas at standard conditions when all the hydrate cages are completely filled (Sloan and Koh 2008), but in practical studies, this value is much less than 180 m3 (Sloan and Koh 2008). Therefore, several additives have been used to enhance these parameters of hydrate formation (Sloan and Koh 2008). The purpose of this work was to investigate experimentally the effects of three ILs, namely, (BMIM-BF4), (BMIM-DCA) and (TEACl), on the initial rate of hydrate formation, hydrate stability at atmospheric pressure and hydrate storage capacity for the case of methane hydrate. The results are presented in the following sections. Table 1 indicates the specifications, suppliers and purities of the ILs utilized in the experiments. The hydrate former used in this work was methane having a mole purity of 99.95%, purchased from Air Products Company. The deionized water was provided in our laboratory. The ILs aqueous solutions were prepared by using a gravitational method with the accuracy of 0.01 weight percent (0.0001 mass fraction). An electronic A&D balance (HR-200 laboratory balance, Japan) with a capacity of 210 g was used for this purpose. The heart of the experimental setup is the stainless steel (SS-316) reactor/cell having a total volume of 90 cm3. The reactor can withstand the pressures up to 15 MPa. For measuring the temperature of the reactor, a high precision thermometer (Pt-100, OMEGA Company, UK) with a precision of ± 0.1 K is linked to the reactor. Pressure measurement inside the reactor is conducted by a pressure transducer (P-2, Validyne Company, USA) which is connected to the reactor with an uncertainty of 0.25% of the full scale. The reactor is put in an ethanol cooling bath. The adjustment of the temperature is obtained by applying a controllable circulator (TCS-1) which is capable of programming (Julabo FP-50, Germany). 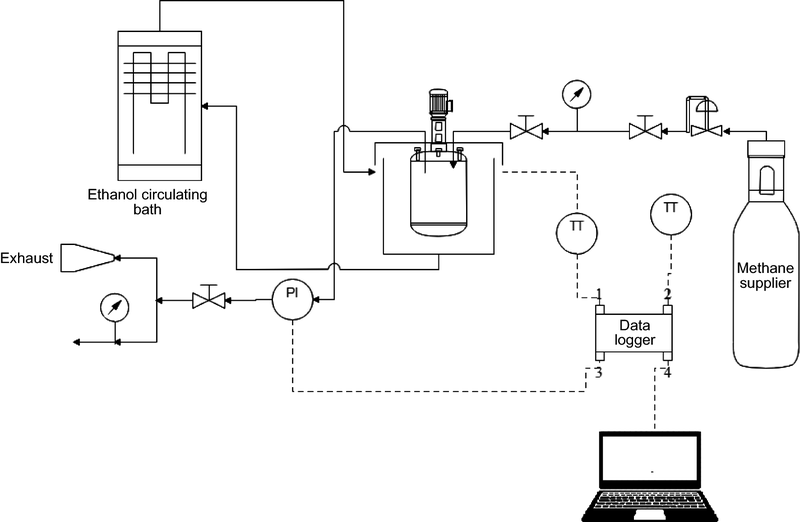 Figure 1 demonstrates the overview of the experimental setup. The gas consumption rate is determined by plotting the diagram of gas consumption versus time. Figure 2 shows the moles of gas consumption at different times. The initial rate of hydrate formation is evaluated as the slope of the gas consumption versus time plot at the time that the consumption rate increases suddenly (as shown in Fig. 2). After the accomplishment of the gas hydrate formation, the reactor was cooled to 268.15 K over 2.5 h and the system was kept at this temperature for 10 h to gain the stability conditions. Then, by opening the vent valve, the excess gas in the system was removed and the system pressure reached atmospheric pressure. Then, the system was left for 10 h at this temperature to measure the hydrate stability at atmospheric pressure and the change of pressure with the time was recorded for 10 h to analyze the stability of gas hydrates, which were formed in each experiment. After examining/estimating the stability of methane hydrate at atmospheric pressure, the system was warmed up at the slow rate of 1 K h−1 to reach ambient temperature (25 °C), and by having the knowledge about the final pressure of dissociation and calculating the moles of methane entrapped in the hydrate cavities, the methane hydrate storage capacity could be calculated. After computing the moles of methane that were entrapped in the gas hydrate lattice, the volume of this amount of methane at standard conditions was calculated (273.15 K, 1 atm). Then, the number of moles of water in 20 cm3 solution was calculated. Then, by having information about the standard molar volume of hydrate for each structure that was reported by Ballard and Sloan (2002), we could calculate the volume of hydrate at standard conditions. For structure I, the standard hydrate molar volume is 22.77 cm3 mol−1. Finally, by dividing the volume of methane to the volume of hydrate, the hydrate storage capacity was computed which is an important parameter in the gas storage and transportation industry. The first parameter that was measured in our experiments was the initial rate of hydrate formation. The assumption is the equality of initial rate of hydrate formation with the rate of gas consumption. Table 2 reports the results for the initial rate of hydrate formation. We concluded from the results that by increasing the initial pressure, the initial rate of hydrate formation is also increased. 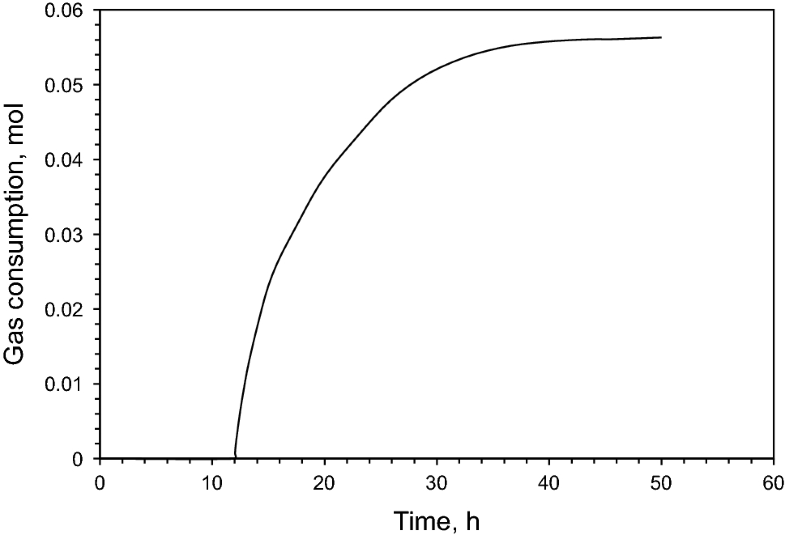 The two ILs with imidazolium-based cations lead to an increase in the initial rate of hydrate formation while the ILs with ammonium-based cations decrease the initial rate of hydrate formation. The results show that the ILs with imidazolium-based cations due to their electrostatic charges have a strong synergetic effect on methane hydrate formation and are good choices to use as an aqueous solution to increase the initial rate of methane hydrate formation. On the other hand, the ILs with ammonium-based cations decrease the initial rate of hydrate formation. It is interpreted from the results in Table 2 that the average rates of hydrate formation in the presence of pure water, 1 wt% BMIM-BF4, 10 wt% BMIM-BF4, 15 wt% BMIM-BF4, 20 wt% BMIM-BF4, 10 wt% BMIM-DCA and 10 wt% TEACl were 0.0556, 0.1087, 0.1263, 0.1535, 0.1667, 0.1362 and 0.0459 mmol min−1, respectively. The comparison between the results shows that 1 wt% BMIM-BF4, 10 wt% BMIM-BF4, 15 wt% BMIM-BF4, 20 wt% BMIM-BF4 and 10 wt% BMIM-DCA aqueous solutions increase the average rate of hydrate formation by 95.6%, 127.1%, 176.1%, 199.8% and 144.9%, respectively. The 10 wt% TEACl aqueous solution decreases the average rate of hydrate formation by 17.4%. For the same concentration of ILs in the water, 10 wt% BMIM-DCA has more synergetic effect on the average rate of hydrate formation than 10 wt% BMIM-BF4. The main reason is the self-preservation of hydrate at atmospheric pressure, which remains hydrate metastable below its hydrate formation pressure, and at temperatures below ice formation temperatures. Hydrate dissociation is an endothermic reaction, when a part of the hydrate is dissociated, it absorbed heat from its surrounding and an ice layer is formed around the hydrate, which leads to the prevention of hydrate dissociation. For the self-preservation of hydrate, many mechanisms have been proposed in the literature (Xiao et al. 2018; Lin et al. 2004; Zhong et al. 2016). The experiments were carried out as a constant-volume process. After dissociation of a part of the hydrate, the pressure of the vessel was increased, and at higher pressures the dissociation of hydrate was harder than lower pressures. It is also concluded from the results that all three ILs decrease the stability of methane hydrate. Figure 3 shows that two ILs with imidazolium-based cations decrease methane hydrate stability more than the IL with ammonium-based cations. Table 3 shows the dissociation of methane hydrate for various solutions at different initial pressures. 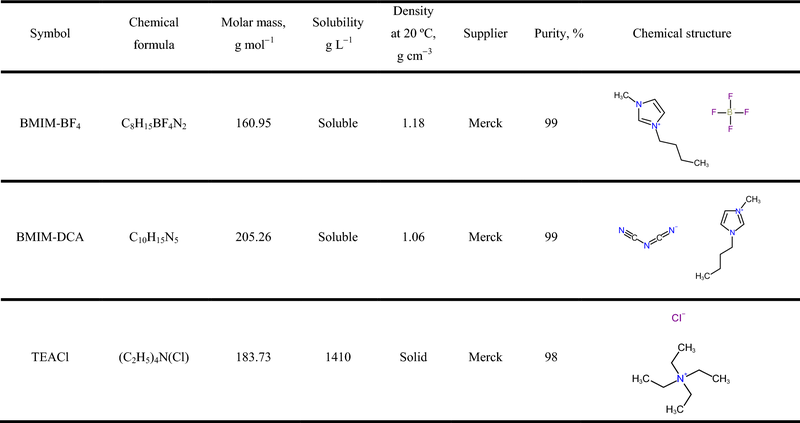 Table 3 indicates that the minimum decomposition rate is for pure water at an initial pressure of 7 MPa and the maximum decomposition rate is for 10 wt% BMIM-BF4 aqueous solution at an initial pressure of 5 MPa. This means that some stabilizers like starch, hydroxyethyl cellulose (HEC) and nanoparticles must be used to increase the stability of IL solutions. Gas injection to the cell was stopped after the hydrate was formed and the hydrate storage capacity was calculated using the final moles of methane in the cell. Table 4 shows the methane hydrate storage capacity for different solutions at different initial pressures. Hydrate storage capacity is one of the most important parameters in the gas storage and transportation industry. The higher the volume of gas in the hydrate, the higher the storage capacity of hydrate. When the hydrate storage capacity increases, the hydrate technology becomes more efficient and economical to use for storage and transportation of gas. Methane hydrate storage capacity increases by increasing the feed pressure. The aforementioned ILs increase the hydrate storage capacity under the same conditions compared to the formation of methane hydrate in the presence of pure water, and the synergetic effects of two ILs with imidazolium-based cations are more than ILs with ammonium-based cations. For an initial pressure of 7 MPa, 10 wt% BMIM-BF4 and 10 wt% BMIM-DCA aqueous solutions enhance methane hydrate storage capacity by 161.7% and 141.1%, respectively, compared to pure water. The methane storage capacity in gas hydrate form has been reported by several researchers (Ganji et al. 2007, 2013; Mohammadi et al. 2017; Prasad et al. 2014), which were at different conditions such as different pressures, different temperatures and different concentrations of aqueous solutions. The storage capacity is very sensitivity to these parameters, and comparison of the results with the literature data was not performed in this study. The two imidazolium cation-based ILs increase the methane hydrate formation rate while an ammonium cation-based IL decreases the methane hydrate formation rate. 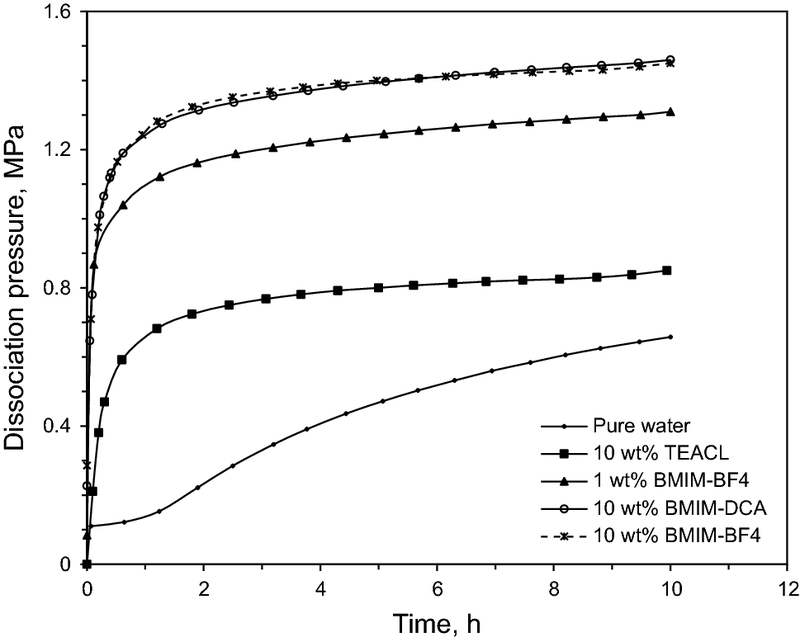 Increasing the concentration of BMIM-BF4 from 1 to 20 wt% results in increasing the initial rate of methane hydrate formation, and the highest synergetic effect is observed when the concentration of BMIM-BF4 changes from 1 to 10 wt%. All three ILs decrease the methane hydrate stability at atmospheric pressure in comparison with pure water solution. The two ILs with imidazolium-based cations decrease the methane hydrate stability much more than the ILs with ammonium-based cations. From the aspect of hydrate stability, the best solution is pure water at an initial pressure of 7 MPa. All three ILs increase the hydrate storage capacity compared to pure water solution. The two ILs with imidazolium-based cations increase the hydrate storage capacity much more than the ILs with ammonium-based cations. For an initial pressure of 7 MPa, 10 wt% BMIM-BF4 and 10 wt% BMIM-DCA aqueous solutions enhance methane hydrate storage capacity by 161.7% and 141.1%, respectively, in comparison with pure water. By increasing the initial pressure, the hydrate storage capacity is increased. The authors wish to acknowledge the Shiraz University of Technology for providing the experimental requirements and computer facilities.